Sikkim, Rhapsody Of The Soul. Sikkim is an abode for the soul searching for tranquility away from the hustle of the world. After all, the word SIKKIM is commonly attributed to the Tsong’s words ‘Sukhim’ which means, a new or a happy home. I believe that’s self-explanatory. Sikkim has been hailed as one of the world’s last utopias by legendary Buddhist guru Padmasambhava. That being said, it is arguably one of the loveliest destinations in India. The Rhododendron-clad Mountains, the stunning views of mount Khangchendzonga (8598m) from any view point of the state, exotic Himalayan Wildlife and the yummy local food. No wonder it’s such a haven for travelers. If you’re planning for a detour from reality this is the place to be. The nearest airport is in Bagdogra, West Bengal. The most common base city for travelers is Gangtok in North Sikkim. Every place is easily accessible from here. The best way to reach Gangtok from the Airport is by taking a cab. It takes around 4-5 hours. Make sure the hotel you’ve chosen has a taxi service available to take you around Sikkim because there is absolutely no local transportation available to travel outside Gangtok. 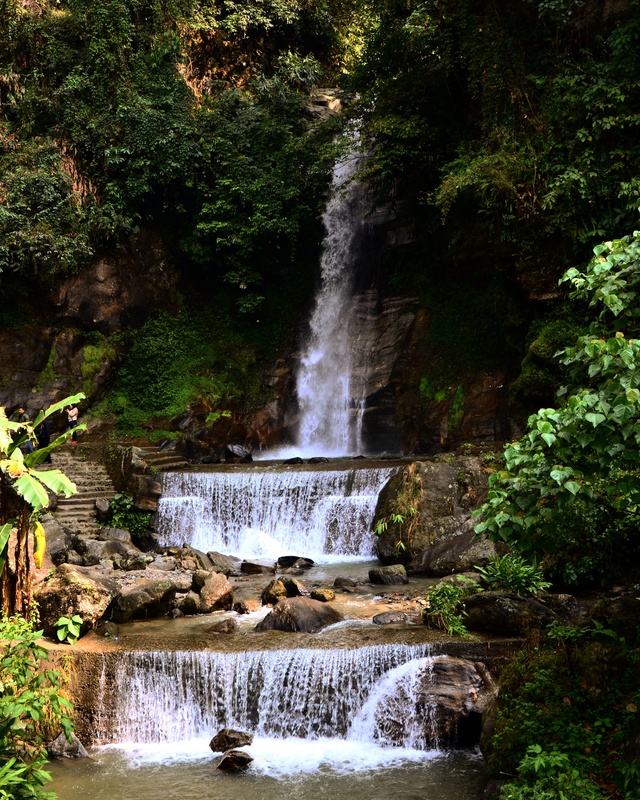 It is a beautiful waterfall, some 5 kilometers out of Gangtok. This park has a shamanistic theme. You walk through the cultures of Sikkim surrounded by beautiful flowers and chirruping birds. Which is like the cherry on the cake. One of the highest lakes in the world at 17,800 ft. It is considered to be sacred and is said to have curative powers. The majestic emerald blue color of the lake will leave you breathless, literally. There is paucity of oxygen and hence it is advised that each traveler must stay there for an hour, tops. Also, people having any heart conditions or asthma are not permitted to go. It is surrounded by snow-capped mountains and a glacier with the same name. A trip to Gurudogmar Lake is a must. If you love road trips, you’ll never forget this one. You have to take a cab with a permit from your hotel. A permit is a must! The road, oh! the road. Every time I look at the photos I keep flipping back and forth trying to relive each moment. So, this is a complete one day tour. Goes in steps, first comes the Tsomgo Lake, then the new Baba Mandir, followed by the Old Baba Mandir. Tsomgo Lake, misty blue water surrounded by mountains reflecting their light into it. The colors catch your eye. The combination of red-blue-yellow-green on the flags just makes the scene pop. And makes a wonderful opportunity for a photograph! Then comes, Baba Mandir. Make sure to go to the old one. The view from there is just amazing. You’ll love the drive as you follow the mountain trail. If you’re going from November to April, you’ll find loads of snow. Alongside the road you’ll cross many small lakes, just as beautiful. One of which is amusingly shaped like an Elephant. Make sure to stop along the way, wherever possible to embark the beauty and breathe in the freshness. The story of Baba Mandir (or Baba Harbhajan Singh Memorial) is truly enthralling. It’s important to connect to the places you go to. I believe, you’ll love the place even more once you know the history it carries along. 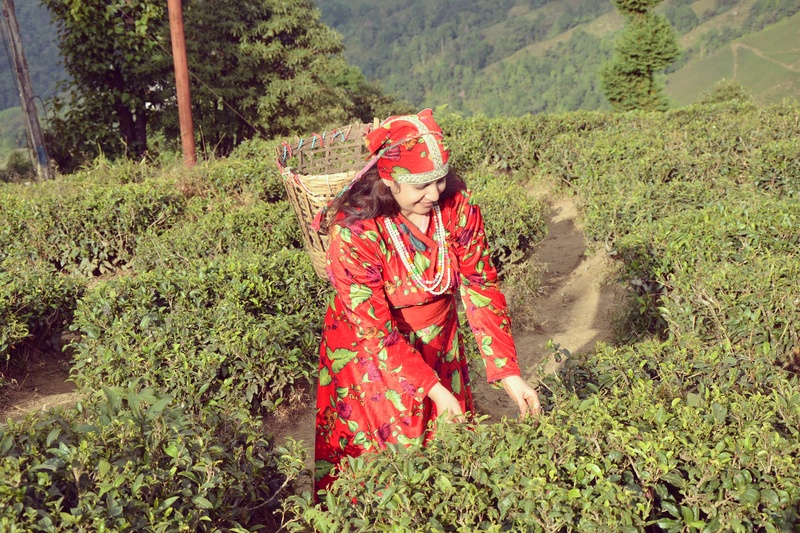 Temi Tea Garden is Sikkim’s sole tea estate. The tea is marked by its exotic odor and flavor. Sit with leisure at some café, buy tea, take a walk along the tea garden and maybe be even get a photo clicked in the traditional attire carrying a basket. Like this one. This market place was heaven for a shopaholic like me. Girls, you’ve got to visit this place at least once on your trip to Sikkim. After all, who doesn’t like collecting souvenirs? Monasteries of Sikkim are renowned all over the world. Sikkim has over 200 Monasteries. Below is the Rumtek Monastery, also known as the Dharma Chakra Centre. Have you been to Sikkim as well? Share some pointers which we may have missed out. We’ll love to feature them as well. Pin this beautiful Sikkim Guide for later!